When an existing "as is" process needs analyzing or an existing managed process requires analysis it enters the "Analyze Processes" process. The Project Manager is responsible for conducting a validation review of the process maps. During this review the Project Manager ensures that the maps are complete, confirms that the data is accurate, gains a consensus on the process, and verifies that the captured processes and decisions made meet the goals and objectives for the project. Once the validation review has been completed for the process maps a second review of the maps should be conducted. All Task descriptions should be in the verb/noun format (i.e. Review the map) and Task Link descriptions should be in the noun/verb format (i.e. review complete). If you discover any descriptions are unclear or inaccurate then revise then so that the reader completely understands their meaning. Check the maps for consistently in names used (Roles, Resources, Guidelines, etc. ), any name used in the process map should be spelt and used in the same manner throughout the process map. 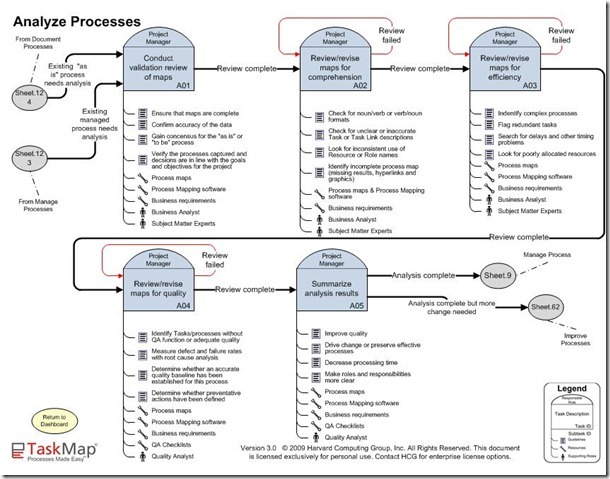 Details of managing processes courtesy Harvard Computing Group,Inc.